'The Zimbabwean military's takeover of power and detention of President Robert Mugabe "seems like a coup", key regional bloc the African Union says. Its head, Alpha Conde, said the AU demands an immediate return to constitutional order. The military denies staging a coup, saying that Mr Mugabe is safe and that it was acting against "criminals" surrounding him. Their move follows a power struggle over who might replace Mr Mugabe. His vice-president, Emmerson Mnangagwa was fired last week, making Mr Mugabe's wife Grace the president's likely successor - but leaving top military officials feeling sidelined. Does anybody in the Alt-Universe remember the connection between Cecil Rhodes and Zimbabwe, formerly called Rhodesia ? "Why should we not form a secret society with but one object," he once said, "the furtherance of the British Empire and the bringing of the whole world under British rule, for the recovery of the United States, for making the Anglo-Saxon race but one Empire?" Re: The End of Mugabe ! - Land Reform - Who cheated Who ? Lancaster House Agreement - Land Reform - Who cheated Who ? Re: The End of Mugabe ! Robert Mugabe offers a fascinating history about behind the scenes politics that Zimbabwe had with its former colonial power. Mugabe was a favorite of the British and often touted as the model for democracy after colonialism because he went along with their demands. It was only after he supported Land Reform in Zimbabwe when they started to ostracize him. A few things we note that most people do not know about Mugabe and particularly about his relationship with the British government. 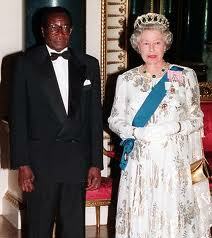 Sir Robert Mugabe Knight Commander of the Order of the Bath knighted in 1994 by her Majesty the Queen Elizabeth of Britain. Why was Mugabe knighted by the British to begin with? If you can answer the million dollar question we at GBH will greatly appreciate it. We know that he has since been stripped of the title so why in the first place was he knighted? In 1979 Sir Robert sold his country at Lancaster House agreements where to this day the transcripts have not been declassified and are not available to the Zimbabweans the people whom Mugabe says he serves. The agreements at Lancaster had far reaching effects on Zimbabwe’s economy that many citizens never understood because of the secrecy surrounding this agreement. Even though Mugabe was Prime Minister in 1980 lessons from Lancaster indicate that whites still controlled Zimbabwe. At Lancaster Mugabe agreed to redistribute land after 10 years yet land was the central theme of the liberation movement. This allowed many white citizens to continue to control the land a central part of the economy and they had guaranteed positions in Cabinet and Parliament. The Lancaster House Agreement left land in the hands of the minority whites and pacified blacks with a mirage of power merely symbolic in the form of political power but no economic power. Sir Robert in his policy of Reconciliation did not rock the boat and upheld the status quo for minority whites in the country. Whites were still controlling Zimbabwe but with a black face as Prime Minister and as President later. Sir Robert murdered more than 20,000 people in Matabeleland but Western nations turned a blind eye because these lives were of black citizens yet fought Mugabe tooth and nail over the death of 100 minority whites. When the farm invasions started in Mashonaland East by the Svosve people, Sir Robert sent the army and the police to stop land invasions. It was only after Mugabe lost the Constitutional Referendum that he decided to pass the Land Reform Act. At the time white farmers were also partly funding the Movement for Democratic Change a newly formed opposition party which greatly infuriated Mugabe because he felt betrayed. The Referendum also empowered Mugabe to use land as a political tool because the economy was failing and he sought to blame white farmers for the problems that majority black citizens were facing. Mugabe despite his autocratic ways remained in right standing with the commonwealth until he supported farm invasions by launching what he termed, “Third Chimurenga”. Knighthood only rescinded in 2008., why? Why indeed was Mugabe ever knighted? I'm not a fan of Mugabe, but he did stand up to the imperialist efforts of the UK, EU and US, and for this his country was mercilessly attacked with genocidal sanctions. He has also given me many laughs over the years, including when he stated that the British Government were "all gays", but I can't find a reference for that. And here where he has a run in with his nemesis Peter Tatchell. In this clip you will see Tatchell take a dive which would make an Italian footballer blush, and he then hilariously re-positions himself to be lying in the roadside gutter where he gets up a makes an emotive statement to the waiting media. 'Zimbabwe’s new leader has returned from exile to be greeted by a vast and enthusiastic crowd hoping for a better future, after the dark past of Robert Mugabe’s 37-year rule which left the country traumatised and internationally isolated. Whether 75-year-old Emmerson Mnangagwa – who was an ally of 93-year-old Mr Mugabe during years in which the government was accused of abuse and corruption – is the right choice to lead the nation from its troubles, is open to question. But “The Crocodile” – as he is known – is the man of the moment amid the euphoria which has followed the demise of Mr Mugabe. He will be inaugurated as President on Friday, staying in position until elections due next year. Speaking to a crowd which had been waiting for him at the headquarters of the ruling Zanu-PF party, Mr Mnangagwa began by reminding people that he had been sacked by Mr Mugabe and had fled to South Africa because of threats to his life, including an alleged poisoning three months ago. As he was being introduced, the President in waiting spoke with his wife Auxilla beside him and a semi-circle of bodyguards. He also danced a little to the music around him, before continuing to address the crowd. Re: The End of Mugabe ! - - - Golden handshake - - ! 'Cash-strapped Zimbabwe has reportedly offered a $10 million payout to deposed President Robert Mugabe, while his wife will receive a generous pension after his death, and his children’s businesses won’t be touched by the incoming administration. Mugabe, 93, currently receives a $150,000 annual pension, which will be partly inherited by his 52-year-old second wife Grace Mugabe, who is pejoratively known as “Gucci Grace” among some Zimbabweans. The two are expected to stay in the Blue Roof mansion in Harare, with the state still paying all travel, security and staff expenses for the couple. The property of both of Mugabe’s children, and his wife’s son Russell from a previous marriage “will not be seized or in any way molested,” the Guardian reports. Mugabe’s extended family owns a range of dairy farms, and has notable interests in the country’s mining industry. A lush and picturesque vista, rolling hills, rich and fertile soil watered by a deep dam, the greenery pitted with seams of gold being mined, all within striking distance of the markets of the capital Harare. Mazowe was a very attractive place to work and live, and that was the reason Grace Mugabe was determined to get her hands on it. Robert Mugabe’s wife normally got what she wanted. Zimbabwe’s First Lady focused on turning this piece of Mashonaland into her domain. She had farmers evicted from their land, got the owner of a dairy to sell it to her at a knock-down price, had her minions muscle in on the goldmines, and even took over the state-run dam. Ms Mugabe also opened an orphanage with much publicity and complemented it with an expensive private school. And, of course, there was the need for a home for herself, a lavish mansion in a secure complex. “Graceland”, as it became known, took shape with the police and hired thugs acting as her personal force and descending on those who had the temerity to object. 'Zimbabwe's new president, Emmerson Mnangagwa, appointed senior military officials to top posts in his new cabinet and chose a veteran cabinet minister to head the finance ministry. 'President Emmerson Mnangagwa's ruling party has cruised to a large majority in Zimbabwe in the first elections since Robert Mugabe was ousted from power. ZANU-PF won the majority of seats in parliament after sweeping rural constituencies by huge margins, official results showed today. It sets the stage for victory for Mnangagwa, a military-backed veteran hardliner nicknamed 'The Crocodile'. The Zimbabwe Electoral Commission results showed Mnangagwa's ZANU-PF cruising to a big majority after picking up 109 seats against 41 for the opposition Movement for Democratic Change (MDC). Another 58 seats are yet to be declared. Spam_A Spam_B The House of Assembly of Parliament has 210 seats and ZANU-PF would need to win 30 more to have a two-thirds majority that would allow it to change the constitution at will. The document is thought to have been produced by Zanu-PF officials for circulation among foreign diplomats at the African Union summit, currently underway in Addis Abbaba. It will concern observers already worried by the increasingly hard line taken by the Zimbabwean authorities. The protests last month led to sporadic incidents of rioting and looting, which prompted a brutal crackdown by the police and the army.